Scorpions like to live in dry, deserted areas, and that is the reason they are commonly found in Gilbert. Their biggest characteristic is their stinger located on their back that they use to apply venom to their prey or to defend themselves; we recommend to stay away from scorpions as they have a painful sting. In Gilbert, Varsity and Termite Pest Control has years of experience in scorpion control, so we can proudly guarantee that our scorpion experts will make sure you don’t have to worry about them again. Scorpions are so small they can access any room in your home, so if you ever find a little hole in your wall that has the size of a bug, you should contact a scorpion pest control company as fast as possible. Varsity and Termite Pest Control can prevent a scorpion pest with our Scorpion home sealing. Our positive reviews in Google reviews, Yelp and our A+ in Better Business Bureau shows how involved we are in everything related to scorpion pest control. Scorpions can be harmful to all your family, including your pets. Not every type of scorpion carry a venom in their stinger, but their sting can still cause some skin issues. With just a quick call, we do a thorough inspection of your house to find out what kind of scorpion control you need. 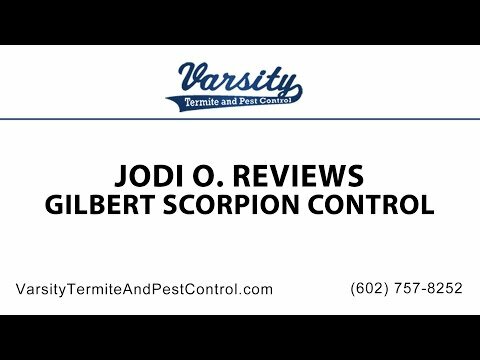 For premier Gilbert scorpion control count on the experts at Varsity Termite and Pest Control. We always get the job done for the best price. Check out our reviews. Jodi O in Arizona writes “He was clean and quick. Mindful of my pets and respectful. I shopped around and found this to be the best price. Would absolutely recommend them to family and friends!” Thanks Jodi. So don’t go with just anybody, go with the best, go with Varsity Termite and Pest Control. Call us at 602 757 8252 or go online to VarsityTermiteAndPestControl.com, today. As the town of Gilbert, AZ continues to grow by adding new housing developments and business parks all the time, it is sometimes difficult to remember that not too long ago, it was primarily a farming town and that by building homes and developing new neighborhoods all over he area, pests and critters have been displaced from their natural habitat. So when you wake up in the morning and see a scorpion on your wall, it is not really all that surprising, but that doesn’t make it any less unnerving. To get the peace of mind you and your family deserve you need to work with a Scorpion removal and prevention technician who understands what you are up against. Varsity Termite and Pest Control is that expert. Our experienced exterminators have been providing top quality scorpion prevention services in Gilbert and surrounding areas for years. How do you know you are working with the best pest control experts? Because they have stellar reviews and are Gilbert’s favorite scorpion control team. Varsity takes pride and care in employing well trained and experienced scorpion control technicians that employ proven methods to give you a new found feeling of safety in your Gilbert home and/or business. It is important to be able to trust the ability of your pest control technician, especially when dealing with dangerous and hard to get rid of creatures like scorpions. While you may think that all scorpions are more or less the same, there are in fact over 1000 species of scorpions to be found all over the world, around 50 of those can be found in Arizona along. They are classified as arachnids and as such related to spiders, ticks, and mites and are very common to Arizona and other state in the Southwest. While most scorpions are not poisonous for an average, healthy person, they can be outright dangerous for the very young, the elderly or those with compromised immune systems. It is therefore in your best interest to remove any and all scorpions from your Gilbert home and to keep them from coming back. Varsity can help. How? With our proven and affordable Gilbert Scorpion Home Sealing Services. Yes, there is a way to keep scorpions from (re)entering your Gilbert home. “Scorpion Barrier” by Varsity has kept scorpions out of homes for years. We are a leader in Gilbert scorpion control services and get excellent results. With our unique and effective scorpion sealing system, you will be protected with several layers of scorpion protection, around the clock. In order to offer you the best scorpion protection possible, your scorpion control technician will seal those areas of your home that the pests like to enter through. These include door frames, thresholds, vents, plumbing and electrical outlets, and other common points of entry. But sealing alone isn’t enough. When sealing your home, it is important to know which vents and areas can be sealed and which need to be screened instead to ensure that there is still proper airflow in your home. In addition to sealing, we also dust areas where scorpions commonly like to gather such as the attic, empty and void spaces, block fences, and other hiding spots. We understand that there are many companies around that claim that they have found the cure for scorpions in your home, so why should you choose us? Because we stand behind our work. Most of our pest control technicians live in the area they service, which means they are taking care of their neighborhood. This also means that they are aware of pests prevalent in this area and understand how to approach common problems. By assigning the same technician to each Gilbert pest control customer, Varsity ensures continuity and cohesion in your pest control service, making it exceedingly efficient. Together with your scorpion technician, you will devise a plan for your unique pest control needs. This plan may vary in frequency or application from that of your neighbor based on your needs and pests. Varsity Termite and Pest Control has over twenty years of experience dealing with pest control, so we promise not to leave a single pest in your house. Don’t hesitate to contact us for more information about our comprehensive pest treatment services. Varsity Termite and Pest Control not only specializes in Scorpions but also in termite pest control. Termites feed on everything in your house that is made from wood, so these little creatures are more than capable of biting your furniture, doing some serious damage. If you see signs of termites, don’t hesitate to contact us. In Gilbert, Varsity Termite and Pest Control can guarantee to be the scorpion pest control company that has the fastest response to your needs. Just tell us when and where you need us, and we will arrive shortly with our pest control equipment. Varsity Termite and Pest Control is your top provider of pest control services in Gilbert, AZ. No matter if you need help with a scorpion problem, cockroaches, termites or an ant infestation, we answer your call as fast as possible and even provide free pest inspections. Our technicians are fully certified and all of our services, call us today! We are looking forward to meeting you and your pest control needs.